Any object or a building in order to survive its designed life and serve the function for which it is designed has to bear its own loads and loads applied or loads coming over it. From that point of view a chair should have sufficient strong thick legs and firm support and so on. Thus, those components of any object which take the load and make survive the object are called the structural components of that object. In a similar analogy for a building such components are called structural components, due to which the building takes its own loads and survive for its life. In view of the above the walls, columns etc., are structural components of the building. With the advancement of the technology different geometrical configurations like framed structure, load bearing structure, shed structure etc., are popularly used to withstand the loads of different buildings. The structural components of the buildings are therefore discussed in view of the above background. All buildings have similar components such as foundation, plinth, walls, floors, doors, windows and roof. Every component has its own function. Non-structural components are parapet walls, door and windows, furnishings fixtures, partitions or partition walls, tiles, paint etc. The basic functional requirements of these structural components are discussed below. Also Read: What is One-way Slab? The foundation is the most critical structural component of any structure and many failures are probably due to faulty foundations rather than any other cause. A good foundation must remain in position without sliding, bending, overturning or failing in any other way. To achieve this, the designer must make sure that the superstructure, foundation and soil act together. It is also important to study the nature, strength and likely behavior of soils under loads along with the knowledge of materials for foundations and superstructure. 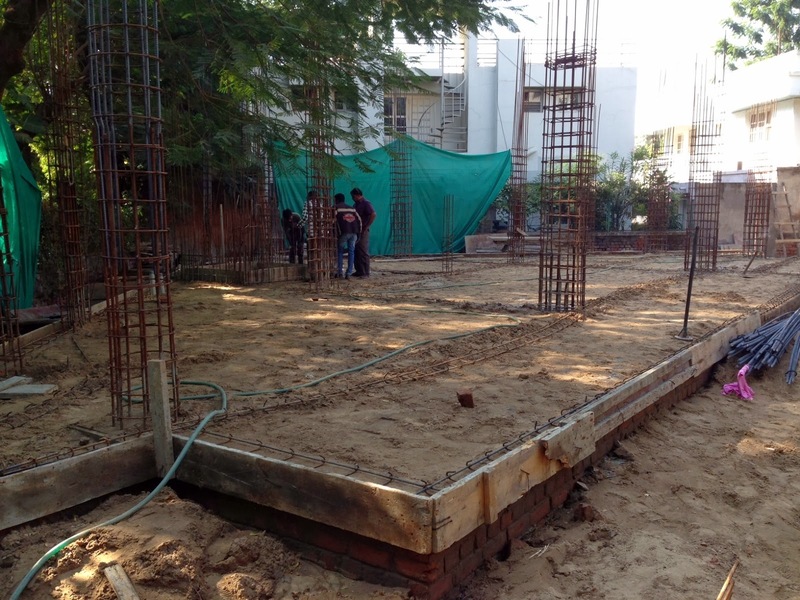 The main function of foundation is to transfer load of entire building to the underlying soil. Also Read: What are the Different Types of Raft Foundation? To increase the stability of structure against overturning due to wind uplift. Foundation is the lowest part of a structure below the ground level which is in direct contact with the ground and transfers all the dead, live load and other loads to the soil on which the structure rests. The provision of foundation is made in such a manner that the soil below the foundation is not stressed beyond its safe allowable bearing capacity. Depending upon the type of soil existing at site, its safe bearing capacity and the type of building which is required to constructed, a structure may need shallow or deep foundations. In case of load bearing walls, the foundation could be in the form of spread footings. For framed structures, the foundation could be in the form of independent column footings, combined footing, rafts or piles. The portion of the structure between the surface of the surrounding ground and surface of the floor, immediately above the ground known as a plinth. The level of the surrounding ground is known as formation level or simply ground level and the level of the ground floor of the building is known as a plinth level. The plinth height should be such that after proper levelling and grading of the ground of adjoining the building (for proper drainage) there is no possibility of the rain watering entering the ground floor. The built covered area measured at the ground floor level is termed as plinth area. Walls are provided to enclose or divide the floor space in desired pattern. In addition, walls provide security, privacy, and give protection against sun, rain, cold and other adverse effects of weather. The division of floor space varies depending on the functions required to be performed in the building. In a well-planned layout, the walls divide the space in such a manner so as to achieve maximum carpet area and minimum area of circulation. Walls are constructed by use of building units like bricks, stones, concrete blocks (hollow or solid) etc. The building units are bonded together with mortar in horizontal and vertical joints and construction is termed as masonry. When bricks are used as building units it is known as brick masonry and when stones are used as building units it is termed as stone masonry. A load bearing wall supports its own weight as well as the super-imposed loads transfer it through floors/roofs. A non-load bearing wall on the other hand carries its own weight and is not designed to carry super-imposed load from the structure. They are normally provided as partition walls. Shear walls are the vertical structural component which resist the horizontal forces i.e. wind, earthquake acting on a building structure. Shear wall can also be defined as a wall which are reinforced and made of braced panels to carry lateral forces. Shear wall must provide lateral shear strength to the building to resist the horizontal earthquake loads, wind loads and transfer these loads to the foundation. Shear Walls provide great stiffness to building in the direction of their orientation, which reduces lateral sway of the building and thus reduces damage to structure during earthquake or cyclone. A column may be defined as vertical load bearing member the width of which is neither less than its thickness nor more than four times its thickness. Pier is a vertical load bearing structural component similar to a column except that it is bonded into load bearing wall at the sides to form an integral part of the wall and extends to full height of the wall. A pier is introduced to increase the stiffness of the wall to carry additional load or to carry vertical concentrated load. Pier also strengthens the wall to resist pressure without buckling. Floors are flat supporting structural components of a building. They divide a building into different levels so that creating more accommodation on a given plot of land. The basic purpose of a floor is to provide a firm and dry platform for people and for other items like furniture, stores, equipment etc. Floor is generally referred to by its location. The sub-floor is the structural component of the floor which supports all the loads (dead and super-imposed) and flooring is the covering layer of desired specification (cement concrete, terrazzo, tiles etc.) provided over the sub-floor as a finishing layer for aesthetics. A Slab is used as a base as well as a ceiling/ roof to transfer the load of the structure to the beams/walls. The ceiling or roof of the structure is a slab. A slab is a structural component that is used to create flat horizontal surfaces such as floors, roof decks and ceilings. A slab is usually several inches thick and supported by beams, columns, walls, or the ground. It is a horizontal structural component, with top and bottom surfaces parallel and near. Depth of slab is small as compared to its length and breadth. Also Read: What is Two-way Slab? A beam is a horizontal structural element/member spanning a distance between one or more supports, and carrying vertical loads across (transverse to) its longitudinal axis that is capable of withstanding load primarily by resisting against bending. A beam is a laterally loaded member, whose cross-sectional dimensions are small as compared to its length. Beams are structural components on which the slabs rest. The beams transfer load of the slab to the columns. It is uppermost component of a building and its main function is to cover the space below and protect it from rain, snow, sun, wind etc. A roof can be either flat, curved or pitched in shape. The choice of the type of roof is made keeping in view the location of the building, weather conditions, funds available and functional and aesthetics requirement. The structural components of roof decking in case of pitched roof is generally a truss, in case of curved roof it is a shell or dome and in case of flat roof it is a flat slab. The roof covering or roofing which is provided over pitched roof could be in the form of tiles, slates, A.C. sheets, G.I. sheets, etc. In case of flat roofs, the roof covering is termed as terracing, which could comprise of a layer of varying thickness of material like lime, concrete, mud phuska etc. The terracing serves dual purpose i.e. (i) Providing suitable slopes on the roof top for draining of rain water. (ii) of acting an insulation layer for providing thermal comfort to the users of the space below. A stair may be defined as a structure comprising of a number of steps connecting one floor to another. The stair should be constructed in such a manner that it is safe and comfortable to use and it should be so located as to permit easy communication. The selection of the type of material to be used depends upon the aesthetical importance, funds available, durability and fire resisting qualities desired. The openings are provided in the wall of a building to accommodate the doors or windows. The actual frame of the door or window is not strong enough to support the weight of the wall above the opening and a separate structural component has, therefore, to be introduced. This is known as a lintel, and is similar in character to beam. Weather Shades or chhajjas are generally combined with lintels of windows to protect them from the weather elements such as sun, rain, frost etc. Windows sills are usually weathered and throated to throw the rain water off the face of the wall. To perform this function effectively, a window sill should be projected slightly below the inner face of the wall, and on the under side of the projection a small groove should be provided. Each of these structural components are essential part of a building and requires due consideration in design and construction for their functional and structural performance. Floor Components: All You Like to Know! Next PostNext Cutting Electrical Chases in Brick Wall | Guidelines to Keep in Mind!